We have just finished a very gratifying Historic Slate Restoration project at the Grove Street Cemetery in New Haven, CT. Lying directly behind the Egyptian Revival gateway arch is the Main Grounds Building, which was erected shortly after 1845. 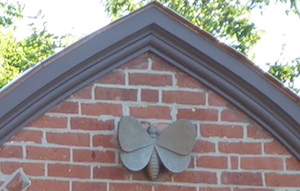 A highlight of this brick building, originally a chapel for funeral services, is the gilded moth at its peak; an Egyptian symbol of the soul of a departed person fluttering up to heaven. 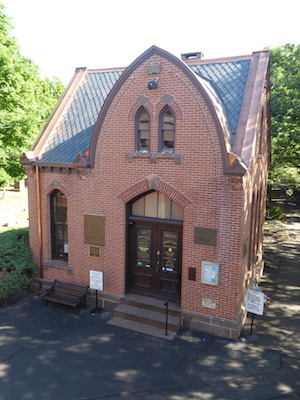 Like the cemetery itself – the first “planned cemetery” in the United States, according to this New York Times article – the building is a National Historic Landmark, recorded in the National Register of Historic Places. This project took just about a year to complete. We had to remove the original slate roof and do a significant amount of reconstruction to the underlayment. 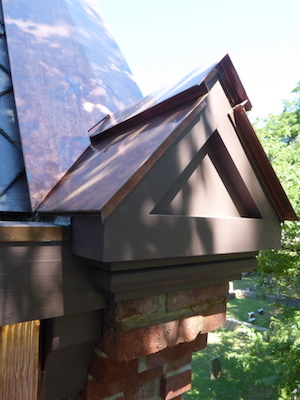 In addition, the decision was made to match the new roof, including its architectural flourishes, to the original design so we had to do some research and use historical photographs to model and then fabricate the accent flourishes. Once the research, design and preparation work was completed, we moved forward with the installation. 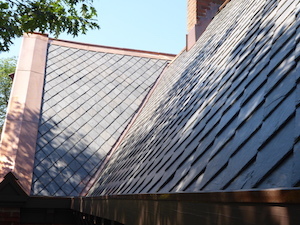 For the primary historic slate restoration, we specified and installed Vermont Slate manufactured by the Evergreen Slate Company – who have provided product for some famous and elaborate slate roofs in both the US and abroad. To map to the historical rendering, we used a chisel cut (also called diamond cut) slate pattern. 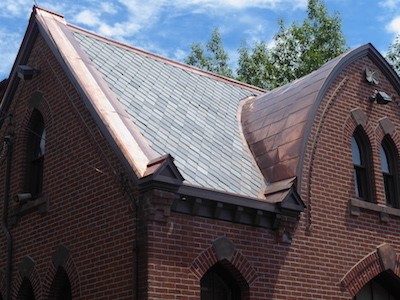 For the metal work on the roof, we specified and used 20 ounce red copper. 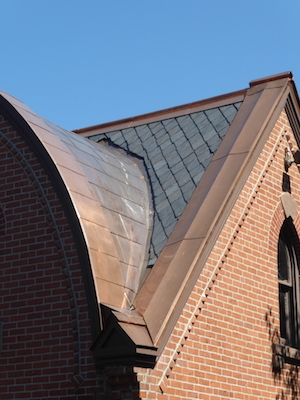 A noteworthy aspect of this component of the job included the beautiful flat seam dome at the front of the building. Additional metal work included fabricating all the built-in yankee gutters and downspouts. Roofing this National Landmark was a real labor of love for myself and my team. Recreating the original roof from historic photos using traditional methods was a dream come true for us. It was so gratifying during our last day on the job to hear an passerby remark to his companion, “That’s one of the most beautiful roofs in all of Connecticut.